You can flip this card into face-down Defense Position once per turn during your Main Phase. When this card is flipped face-up, increase the ATK and DEF of this card by 300 points until the end of the turn that this card is flipped face-up. This card is a very interesting addition to a Zombie deck. You can't search it, but you can make it into a Beatstick for a turn. It's the only one of the "flip back down in Main Phase Two" monsters whose effect triggers if it is attacked instead of flip-summoned. HOWEVER...the effect occurs after damage calculation -- meaning if a 1900 Attacker attacks this, IT STILL DIES. It can hold its own against control, and can pretend it's a beatstick for a turn...not a bad addition for Zombie. But it doesn't stand out like any of the other major zombies. Royal Keeper is an interesting monster. The stats make him unsearchable by all but Pyramid Turtle, but his relatively decent DEF might be enough to defend him against certain attacks and he can do some damage in a pinch. The effect is what makes him worthwhile, obviously. It has the Flip Up, Flip Down effect similar to Stealth Bird, Guardian Sphinx, etc., which is easy enough to understand (and if you don't think it is, just read reviews on those cards for more in-depth explanations). The other effect is also pretty nice. If it's flipped face-up, it gets a 300/300 bonus. Flip Summon him on your turn and he becomes a 1900 that can run away and hide after it attacks. Not bad at all, right? One negative is that if your opponent attacks Royal Keeper, he won't get his DEF bonus until AFTER Damage Calculation, meaning he'll still be killed if a Gemini Elf attacks him. It's unfortunate but true, and it does significantly decrease his playability. Regardless, he still might be worth using in a Zombie deck. Stats: Royal Keeper is a Level 4 Earth/Zombie from Pharaonic Guardian. As a Level 4, it can be dropped into play, no problem. I count 11 other Zombies matching this type, but Pyramid Turtle is probably the best of them. Individually, both types are fairly well supported. As for the ATK and DEF, they are not bad, but not great-1600/1700 will frustrate support and Control monsters, but not much else, and also means that Pyramid Turtle is your sole-searching option. Effect(s): Fortunately, it gets a solid effect. If you if it’s flipped, it gets a +300/300 to its stats until the end of the turn. Sadly, this is applied after damage calculation should it be flipped by an attack (but at least it does go off after that if the ruling didn’t change). It also has the ability to flip itself back facedown, which can be useful if your opponent, for example, has some weenie monster in ATK mode and one huge attacker in play-hit the weenie then hide in DEF mode so you don’t lose LP too. Uses/Combinations: This is support for a Zombie deck pure and simple. Use it with other Zombie support cards, like the aforementioned Pyramid Turtle. Earth decks could use it, but it would probably be a waste. I suppose a deck built around the Flip Summon/Re-Set effect based monsters could also use it, but would such a deck be worth the effort? Casual: 2.5/5-As usual, take it in context-in a deck with a compatible theme, it’s just filler. Tournament: 2/5-It’s still filler here, but I needed another Zombie card for the week that hadn’t been reviewed. ;) It’s not abysmal, but it’s really not going to see play unless you are short on cards. Limited: 3.5/5-Solid pick here, with all the Zombie support floating around. If not, lack of competition makes its stats better, and there’s a good chance of it pulling its effect once, if not multiple times. I mainly covered it as filler-it’s not utterly worthless, but it really should only see play as filler for the decks I mentioned above, while people try to get the cards they really need. This is still a great Zombie beatstick. I'd use him for fun. It gets it's effect when it is flipped face-up, so he could be attacked and get his ability, or by effects like Swords of Revelaing Light. It's also a 1900/2000 when it gets it's effect. 1600 attack can hold off Dons, Tomatoes, Witch, Sangan, Angels, Pyramid's, and other element searchers and can suicide into a counter-less Breaker and Tribe. It's a Zombie, so it can be Pyramid searched, but it can't by Witch or Sangan. It's also Book of Life-able. It also is good to use if you can't get any good Zombie's like Regenerating Mummy or Soul-Absorbing Bone Tower. It's not searchable by Witch or Sangan. It's also not Giant Rat-able, but who plays that nowadays in Zombies? Nobleman of Crossout pwns this like cell phones in mall basements. Other than that, I don't see much else wrong. Overall, I give Royal Keeper a 8.4/10 in Zombie decks and a 7.6/10 in anything else. Little Boy: Hey look! Your Gemini elf attacks my Royal Keeper. It gets 2000 defense! You lose 100! Jae: Sorry little boy. You're wrong! It gets the effect after damage calculation, only if it survives. Little Boy: Wow, this card's weak! I'm taking it out immediately for a godlier card! Well the little boy learned a lesson from me that day. Royal Keeper must survive to keep its effect! Will this hurt the score? Yes indeed! Advantage F/H: A 1600/1700 monster with the chance of hitting 1900 for a turn you say? Excellent! That provides some semblance of field advantage. 6/10. Best Draw for the Situation: Need a monster? Need to stop that D.D Warrior Lady, Tribe-Infecting Virus, Breaker for a turn? This is your man. Unfortunately, he's rather worthless when you're losing to Berserk Gorillas and such. 5/10. Attributes/Effect: 1600/1700. Zombie. Earth. He also possesses one of those nifty flip effect features. For what you might ask? A puny 1900 attack zombie? Decent, but hardly spectacular or use-worthy. 5/10. Dependability: You'll probably get his effect off 50% of the time. He'll get crossed out rarely, and I'm giving him a slightly worse score than a basic 1900 monster. 6/10. The Bottom Line: Yes, I know zombies need a solid 1900 monster. This isn't it. 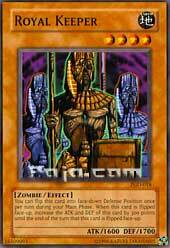 With Regenerating Mummy out, you have no excuse to use this card. A BAD Score: 22/40= 5.5/10 x 10 = 55/100. Cards it combos with: Book of moon/Taiyou if you're feeling frisky and in a mood to burn some cards. Book of life.